There has recently been a huge influx of extremely small dev board based on the ATtiny85. This small 8-pin microcontroller is able to run most Arduino sketches, and the small size and low price of these dev boards means they have been extremely popular. The Digispark was among the first of these small boards, and now the creator is releasing a newer, bigger version dubbed the Digispark Pro. The new board isn’t based on the ‘tiny85, but rather the ATtiny167. This larger, 20-pin chip adds 10 more I/O pins, and a real hardware SPI interface, but the best features come with the Digispark Pro package. There’s real USB programming, device emulation, and serial over USB this time, and the ability to use the Arduino serial monitor, something not found in the original Digispark. There are also a few more shields this time around, with WiFi and Bluetooth shields available as additional rewards. Without the shields, the Digi Pro is cheap, and only $2 more per board than the original Digispark. Would you believe that some people think the internet is a time waster? Well, not at this particular address of course, but we can think of some other sites that are absolute rabbit holes without so much as a rousing game of croquet at the bottom. If you need help achieving what Tim Ferriss dubbed a Low Information Diet, there are browser extensions that will block your access to sites that keep you from getting things done. [Ivan’s girlfriend] has taken this time management tack seriously and even created a simple web page that states “Don’t Waste Your Time!” that will show if she tries to get to Facebook. There’s one small problem with all this, and it’s been around for a long time. [Ivan’s girlfriend] still watches TV. Out of love and respect for her goals, he decided to prank her by blocking her TV viewing. In a delightful twist, the TV will display her own web page to her after 30 seconds. They have digital and analog TVs, so he had to set up both in order to cover his bases. The digital TV is a monitor fed from a set-top box with HDMI out. As the STB can only be controlled via IR remote, [Ivan] used an HDMI switch to change from the STB input to a Raspi that will display the reprimanding web page and play Pink Floyd’s “Time“. The analog TV took slightly more doing. He put a Raspi on the AV input, but connected it from the inside so nothing looked suspicious. The Raspi checks the TV status every second and switches to the Pi once the TV is on. Same deal: judgmental web page, Pink Floyd. The beauty part is that both of [Ivan]’s setups also record her reaction; the digital TV uses a dash camera and the analog uses an Android phone. Check out [Ivan]’s tour of the analog TV Pi after the break. If you or [Ivan’s girlfriend] need even more time management help, there’s always the roll-your-own-Pomodoro timer. A team of scientists at SRI international are creating real-life replicators from Star Gate SG1 — micro-robots capable of smart (and scary!) manufacturing. Thousands working in parallel will be able to achieve tasks previously unheard of, in a completely compact and integrated system. These tiny ant-like robot systems are magnetically controlled and can use tools, move at incredible speeds, and swarm over surfaces. SRI’s vision was “to have an army of ants under your control”. It’s actually been an ongoing project since the 1990’s — but a recent undisclosed chunk of funding from DARPA has helped accelerate the project — giving it a new title of the MicroFactory for Macro Products project. You have to see the video to believe it. Potential applications for these tiny swarm-bots include precise pick & place manufacturing, micro bio-technology, electronics manufacturing, and even rapid prototyping of high quality parts. We get shivers just watching them slide around effortlessly on almost any surface. 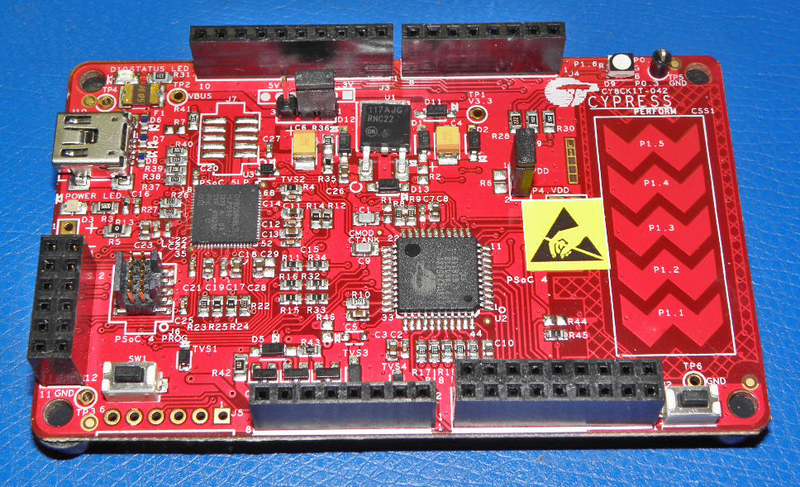 Ever since I received my PSOC 4 Pioneer kit from Cypress I have wanted to play with this little mixed-signal Programmable System-on-Chip (PSOC) developer board. I love developer boards, providing that they are priced in a way to entice me to not only open my wallet but also make time in a busy schedule. I think my kit was free after winning a swag bag from Adafruit that they themselves obtained at the Open Hardware Summit and gave away on their weekly streamcast. Ultimately it was the invitation to beta test datasheet.net which also was included in that pile of swag that led to my getting involved with Hackaday. What is Programmable System On Chip? So what is a PSOC 4? A quick summary is that it’s based on an ARM Cortex reduced instruction set processor (RISC) and is somewhat capable of supporting shields based on the Arduino footprint, and it also uses a bright red PCB that I have come to associate with a Sparkfun PCB. What doesn’t show is the fact that this programmable system on chip has programmable analog function blocks in addition to programmable digital logic blocks. There is also some supporting input/output circuitry such as a multicolored LED and a capacitive touch sensor directly on the PCB. This is an intriguing amount of programmability, so much so that Newark/Element 14 highlighted a “100 projects in 100 days” event on it. Over the years I have had to create or install many Integrated Development Environments (IDE) that linked hardware to software. Knowing that you had to, and how to, implement an IDE was part of being an engineer. Nowadays with the Arduino type environment the user has an IDE pretty much as soon as they click on the executable which I find to be one of the best aspects of the genre. It was so quick in fact that I was able to get my teenaged son into writing his first program even before he remembered to do massive eye-rolls and make sounds of utter disdain. He did give up however, just shy of learning how to have the Arduino make sounds of disdain on his behalf. 3D printers are the tool of choice for all the hackerspaces we’ve been to, and laser cutters take a close second. There’s another class of plastic manipulating machines that doesn’t get enough credit with the hackerspace crowd – the vacuum thermoformer. Surprisingly, there haven’t been many – if any – vacuum formers on Kickstarter. Until now, that is. [Ben] and [Calvin] are the guys behind the MOFO, and built their machine around ease of use and reliability. 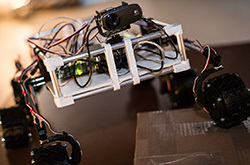 After a few prototypes, they settled on their design of aluminum extrusion for the frame, a ceramic heating element for the heater, and an off-the-shelf PID controller for the electronics. The MOFO has so far been tested with polycarbonate, acrylic, PETG and styrene with good results. The Kickstarter has reward levels of $500 for a 12″x12″ work area, and $1000 for a 24″x24″ work area. That’s not too bad, and building your own similar thermoformer would probably cost just as much. Just the thing if you need to print out a few dozen sets of storm trooper armor.